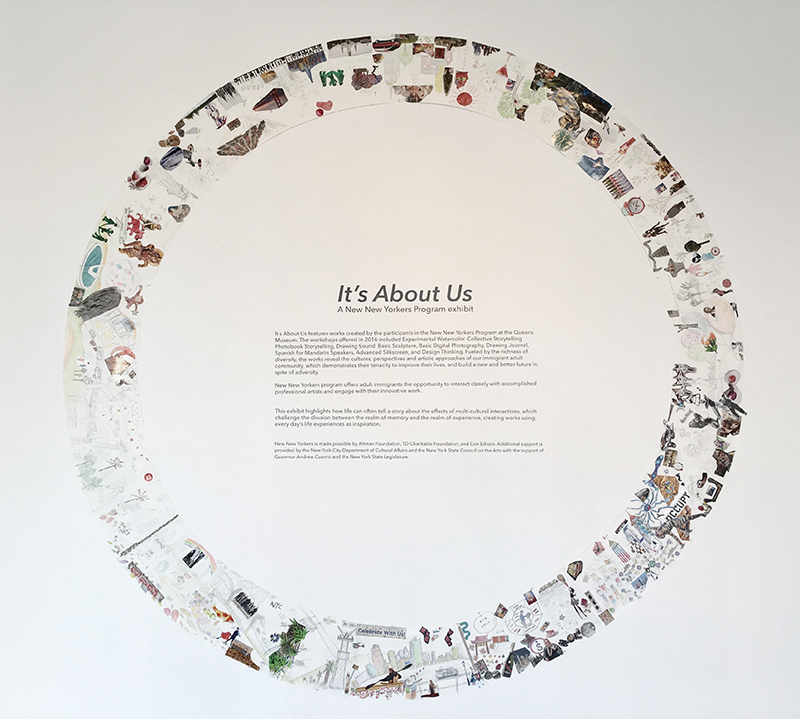 Join the Queens Museum’s New New Yorkers Program to celebrate It’s About Us, an exhibition created by the participants in a wide range of workshops offered in 2016 including: Experimental Watercolor, Collective Storytelling, Photobook Storytelling, Drawing Sound, Basic Sculpture, Basic Digital Photography, Drawing Journal, Spanish for Mandarin Speakers, Advanced Silkscreen, and Design Thinking. These works reveal the diversity of visions, cultures, concerns and artistic approaches of our immigrant adult community that proves their tenacity to improve their life and build a new and better future in spite of adversity. During the opening reception there will be hands on artmaking workshops, video screening and performances led by New New Yorker participants. We welcome public of all ages to join us and celebrate the diversity of our community. Come to learn about the basic techniques of silkscreen and print your own posters! Participants will be able to learn the watercolor techniques and create unique watercolor holiday greeting cards for the loved ones. The photobooth will be run by the NNY photography workshop & Project Luz participants. Come to take some holiday memories home with fun props, and download your free photos from flickr! with Monica Castro, Margarita Hernandez, Rosalba Sierra, Adriana Lemus, Cynthia Gomar, and Letty Zambrano and Sol Aramendi. Drawing sound workshop participants will present an interactive performance with their art pieces which function through an electric circuit created by touch. The participants will also demonstrate their interactive object producing sound in the opening period. The Collective Storytelling screening program will feature selections of work produced during the workshop. It consists of self initiatives on documenting the class, exercises and experiments in video as well as collective storytelling efforts. Two of the workshop participants, Arlene Chico Lugo and Eric Avilés, will create special performances for the opening. In partnership with the Queens Library, the Queens Museum’s New New Yorkers program offers free multilingual classes to meet the needs of adult immigrant communities in Queens. New New Yorkers offers adult immigrants the opportunity to interact closely with accomplished professional artists and engage with their innovative work, allowing them to broaden their horizons and learn valuable life skills through the arts.The program provides opportunities for personal creative expression through rigorous art courses, exhibitions, and participation in cultural festivals. It also supports student-led initiatives at the Queens Museum. Courses emphasize the arts, technology and English language acquisition, provided at no cost, in a variety of languages, most often Spanish, Mandarin, and Korean. New New Yorkers is made possible by Altman Foundation, TD Charitable Foundation, and Con Edison. Additional support is provided by the New York City Department of Cultural Affairs and the New York State Council on the Arts with the support of Governor Andrew Cuomo and the New York State Legislature.